If you take one message away from reading this blog week after week, I want it to be that making is not necessarily a linear process — and that’s OK. Sometimes a project will come together perfectly and everything will go smoothly from beginning to end with results that are exactly as you envisioned. Other times certain variables come together differently than you anticipated, or your ideas evolve as you work. The results may be amazing in a different way than you originally planned, or they may lead you to new discoveries that are more about the process than the product. The latter is what you are seeing today. A few weeks ago, I started knitting #06 Feather and Fan Dress from Vogue Knitting, Spring/Summer 2009. In recent blog posts, I’ve written about some of my ups and downs with the project. This past week, I decided it was time to start over again with some significant changes. By the time I reached the top of the waist shaping for the dress, I came to the conclusion that the smaller size is definitely too small for me. The gauge was about right, so my knitting must have tightened up since I measured it on a previous version. I was also running out of some yarn colors. While I have enough total yardage to finish the dress in the smaller size, my color palette would have become increasingly limited until it ended in a solid block of color. After such colorful stripes at the beginning of the project, the difference would have been jarring. For the newest version, I returned to my original idea of converting the dress to a shirt. I had discarded that plan early on because the pattern is knit from the bottom up; it would have been difficult to determine where to pick up the pattern. Before unraveling the 22 inches that I had already knit, I took the opportunity to measure my progress and count the number of pattern repeats that I could skip when I cast on again. The instructions for the larger size call for using smaller needles in the waist, which would subtly narrow the circumference without further decreasing the stitch count. I decided to omit that detail because I think the waist will be narrow enough as it is. 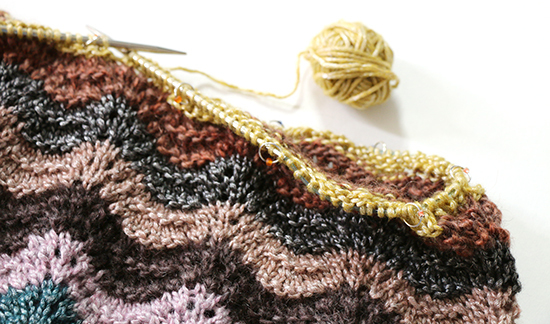 Finally, I decided to make color changes after every two pattern repeats throughout the project. As much as I liked the playfulness of changing the colors more frequently, the dress became more overwhelming to look at as it grew. I’m still not certain that this top will become what I envision. In the meantime, I am embracing the process and adapting with each new discovery.